IO: Students will understand that artists use different kinds of lines to create shapes and express attitudes and ideas. 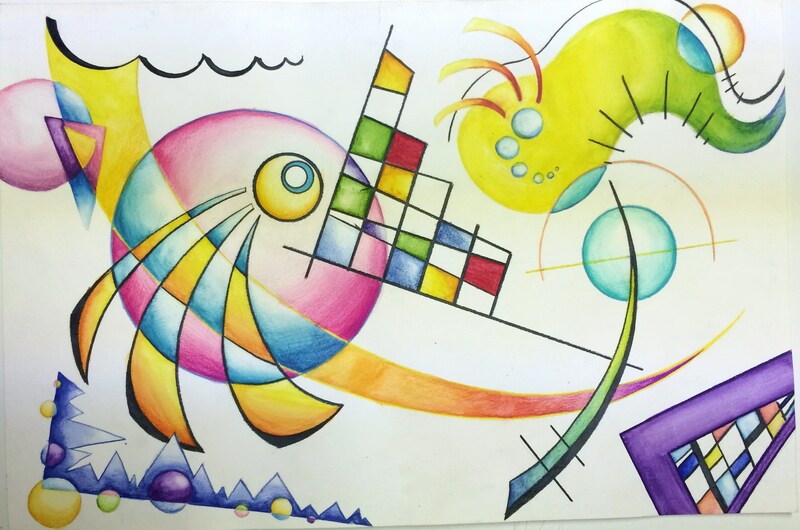 Artists use a variety of geometric and free-form shapes to convey and idea and to represent natural objects and artificial objects. 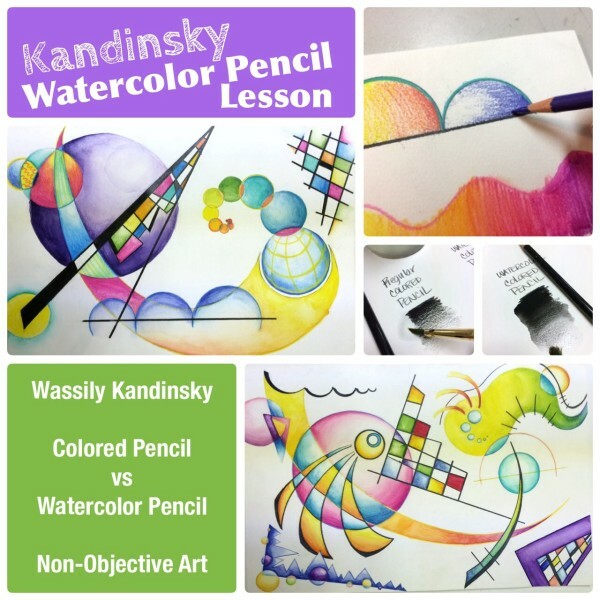 Students will learn about the artist Wassily Kandisky. They will also learn properties of color pencils versus watercolor pencils and understand when to properly use color pencils versus watercolor pencils. Non-Objective Art- Art that is not representational, containing NO recognizable figures or objects. The elements of art (lines, shape color, etc.) are the main subject. Abstract Art- In abstract art the artist takes recognizable objects or figures and changes them so they no longer looks realistic. The artist may leave out details, shift the point of view, exaggerate size, simplify or otherwise distort the image. Colored Pencils-wax based, not water-soluble (cannot be diluted with water), good for hard edges. Watercolor Pencils– Watercolor pigments wrapped in wood casing, water-soluble- just wet a paint brush, brush over one color at at time,and the applied pigment turns into watercolor painting. 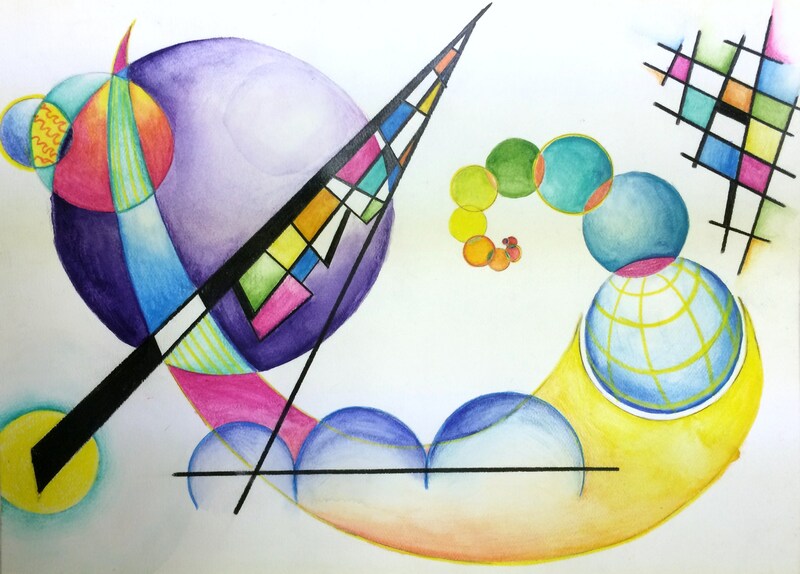 Using the two pencils together: we will be intentionally using the colored pencils and watercolor pencils together. Use the colored pencils for any lines or shapes that you do not want to “blur” or have a painted look-specifically black lines. Use the watercolor pencil to colored areas that you want to look like a painting. This is a great pencil for gradations! In your sketchbook, draw at least 2 designs for your painting. Keep it non-objective. *Remember to place your focal point first (NOT in the middle of the paper!) & use emphasis techniques (size, placement, color contrast) to pull the viewer’s eye. You can use circle templates and rulers to create your composition. On a sheet of water color paper, lightly draw you composition in pencil. Apply all COLORED Pencil areas first. These are they areas that you want hard edge design. 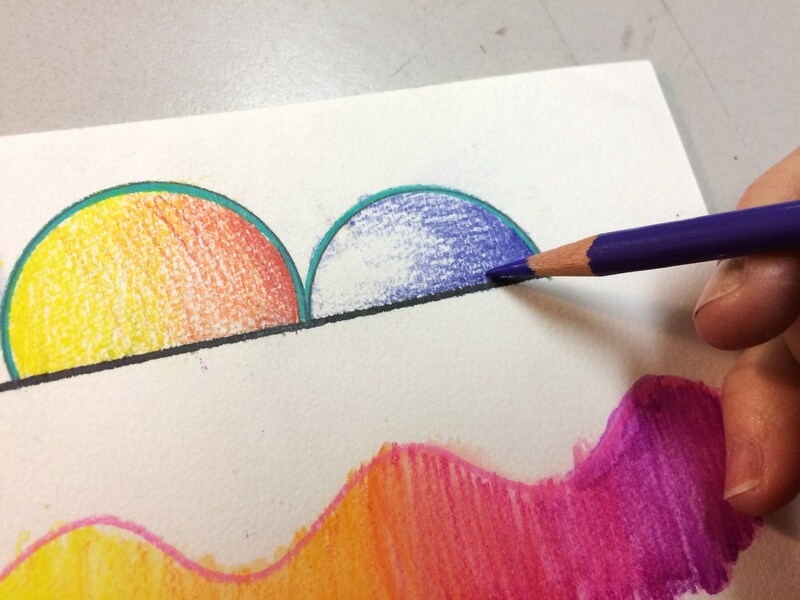 Use the color pencil for BLACK lines or shapes, Solid Lines, Borders around shapes, and Patterns under the watercolor pencil. Next, use the WATERCOLOR Pencil on all areas where there will be Color Washes, Blending of colors, and Gradation of colors. For large areas like the background, you can use a regular watercolor palette.